Organically grown foods are becoming more popular as people worry more about the health and the safety of the food they eat. 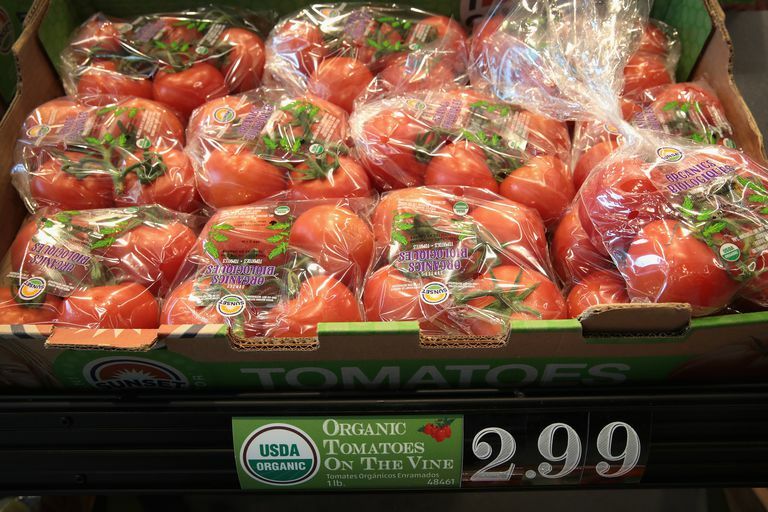 But what exactly is organic food and how is it labeled? "Organic meat, poultry, eggs and dairy products come from animals that are given no antibiotics or growth hormones. Organic food is produced without using most conventional pesticides, fertilizers made with synthetic ingredients or sewage sludge, bioengineering or ionizing radiation." Studies show that the minimal amounts of residues of chemical pesticides found on non-organically grown foods are not dangerous to your health, but organic food advocates claim that organically grown foods are safer than foods produced with regular farming methods. Since virtually all non-organically produced foods contain residues of pesticides, fertilizers, and other chemicals, the only way to avoid them is to buy organic foods. To be certified as organic, food products need to come from farms and processing plants that are certified organic by the USDA. The farms are inspected by certified government officials to ensure they're up to USDA organic standards. The inspectors make sure that only organic methods are used and that the environment is not contaminated with pesticides, synthetic fertilizers or other non-organic compounds. "100-Percent Organic": Foods that are labeled as 100-Percent Organic must contain all organically grown ingredients except for added water and salt. "Organic": Foods that are labeled as Organic need to contain at least 95 percent organic ingredients, except for added water and salt, plus they must not contain sulfites added as a preservative. Sulfites have been known to provoke allergies and asthma in some people. Up to five percent of the ingredients may non-organically produced. "Made with Organic Ingredients": Product labels that claim Made with Organic Ingredients need to contain at least 70 percent organic ingredients, except for added water and salt. They must not contain added sulfites, and up to 30 percent of the ingredients may be non-organically produced. Finally, food products made with less than 70 percent organic ingredients may state which ingredients are organic, but they can not claim to be organic food products. Magkos F, Arvaniti F, Zampelas A. "Organic food: buying more safety or just peace of mind? A critical review of the literature." 1: Crit Rev Food Sci Nutr. 2006;46(1):23-56. Magkos F, Arvaniti F, Zampelas A. "Organic food: nutritious food or food for thought? A review of the evidence." Int J Food Sci Nutr. 2003 Sep;54(5):357-71. Kopke U. "Organic foods: do they have a role?" Forum Nutr. 2005;(57):62-72. The United States Department of Agriculture. "Organic Agriculture." Is Organic a True Must?